We have advanced in what was easiest, in solutions that required less depth in terms of both decision-making and implementation and now we are left with the more important aspects, more decisive for the future development of the country, and also more complex in terms of solutions. (Miguel Díaz-Canel, cited in Morales 2013a). In fact, while the overall number of self-employed workers reached a record 455,557 by the end of February 2014, more than triple the number from fall 2010 (Cubadebate 2014; Mesa Redonda 2014), such unprecedented quantitative expansion belies a number of qualitative limitations as well as ideological and frankly political obstacles that continue to limit the sector’s growth beyond survival-oriented microenterprises. By design or default, these restrictions prevent the transformation of self-employment into a productive and dynamic small- and medium-sized business sector that could form the basis of an emergent middle class. Specifically, in fall 2013 a set of new regulations were issued on self-employment, which — together with a series of highly unpopular official pronouncements — were aimed at reigning in “abuses” and “deformations” that had taken hold the sector. This renewed emphasis on law and order was rolled out despite, or perhaps precisely because of the increasingly evident fact that such supposed “abusers” were successfully competing against the state sector — creating employment and providing goods and services at lower prices and of better quality and wider variety than state enterprises renown for the “exorbitant prices and shoddy quality” of their products (Valdés 2013; see also Frank 2013d; Rainsford 2013; Rodríguez, A. 2013; Cuba Dice 2013; García 2013; Palacios Almarales 2013; Peters 2013c). These law and order pronouncements included the late-September prohibition on the resale of imported goods — especially clothing brought into Cuba by “mules” — and of household items acquired in the state retail sector (Gaceta Oficial 2013a). Later, in early November — after what turned out to be a premature declaration from Fernando Rojas, the Vice Minister of Culture, favoring “regulation” over outright “prohibition” (Juventud Rebelde 2013) — Granma issued an outright ban on the previously tolerated and unregulated but highly popular private 3D cinemas and game rooms — ordering them closed immediately with the words: “cesarán de inmediato en cualquier tipo de actividad por cuenta propia” (they will immediately cease any kind of self-employment) (Granma 2013). The popular rejection of this top-down move toward greater “order, discipline, and command” exposed a fundamental dilemma faced by the Cuban government as it attempts to enact economic reforms that cede space to the private sector. The outright prohibition of activities the government prefers to keep under state monopoly (such as the import-export business and most professions) allows it to exercise symbolic control over the population and impose an apparent order over Cuban citizens and society. However, this control comes at the cost of pushing all targeted economic activity (along with potential tax revenue) back into the black market — where much of it lived prior to 2010 as evidenced by the high proportion of cuentapropistas who are found in government surveys to have been “laboralmente desvinculados” (unconnected to the state sector) prior to becoming legally self-employed (Rodríguez, A 2013; Dámaso 2013c). Meanwhile, the inclusion and regulation of the many private activities dreamed up and market-tested by Cuba’s always inventive entrepreneurial sector would create more legal employment opportunities, a higher quality and variety of goods and services at lower prices, while also increasing tax revenue to target inequality and fund social programs. However, these benefits come at the political cost of allowing greater citizen autonomy, wealth and property in private hands, and open competition against long-protected state monopolies (Celaya 2013a and b). The initial measure outlawing the resale of imported clothing was aimed at those who had been doing so under cover of the license for “seamstresses and tailors.” Likewise, those reselling household items were accused of “speculation” since they had been licensed to sell only items that they had made themselves and not to resell products originally purchased in state retail shops at a mark up.2 According to estimates by Marc Frank and Rosa Tania Valdés of Reuters, these changes likely led to the closure of an estimated 20,000 microenterprises by the end of 2013 (Frank 2013c; Valdés 2013). Specifically, the law added new, more precise occupational definitions that outlawed the sale of imported products and/or those acquired in state-run retail stores by six preexisting occupational categories: agricultural street vendor, food and beverage street vendor, seamstress/tailor, seller of household items, food retailer, and maker/seller of soaps, polish, dyes, etc. While resellers of imported clothing were eventually given until December 31 to liquidate their inventory before having to close their doors, the new restrictions surely hurt many others active in these businesses’ extensive supply chains. For example, a bicycle repair shop may also sell imported replacement parts while a birthday party piñata maker and seller may also sell imported balloons and import the inputs for making the piñatas.3 Imported products arrive through a variety of unofficial channels such as foreign sailors and Cuban workers returning from abroad, tourism by family members visiting Cuba from abroad, or Cubans traveling abroad for various purposes. However, the majority of such items surely originate with the informal supply networks of mulas(mules) developed by Cuba’s microentrepreneurs due to the continued lack of a viable wholesale source of supplies and the prohibition against the private sector engaging in any import-export activity — a state monopoly (Alonso González 2013; Monzo 2013; Laffita 2013; Palacios Almarales 2013). This measure has had a variety of impacts. It has forced many enterprises out of business — or at least out of registered and legal business. Already in early 2014, the casual visitor could observe the many abandoned ferias or market areas where some of these activities had been located (Alfonso Torna 2014).4Of course, as expected, many of these now prohibited activities continue, but now as part of Cuba’s underground economy once again often through the creative use of product catalogues shared hand-to-hand. In fact, during October and November 2013, a veritable chorus of frustrated entrepreneurs and analysts began to publicly decry the government’s decision to chose prohibition over regulation (Rodríguez, A. 2013; Celaya 2013b; Cuba Dice 2013; García 2013; Cárdenas Lima 2013; Rainsford 2013; Palacios Almarales 2013). This popular pushback was even acknowledged by a pair of Granma editorials in November 2013, penned by Oscar Sánchez Serra, the first of which reported that the newspaper was flooded with complaints from readers arguing that the proper response to imported clothing resellers would be proper regulation and licensing, not prohibition (Sánchez Serra 2013a and b).7 Unfortunately for both these entrepreneurs and their customers, this recognition of a “diversity of opinion” by Granma has not translated into any major policy modifications (Dilla Alfonso 2013; Tamayo 2013; Orsi 2013; Xinhua 2013; Kozlowska 2013; Vega 2014) beyond the granting of a “liquidation window” of two months to clothing resellers, during which time all cuentapropistas would be visited systematically by the authorities with the purpose of “gaining their understanding” (Valdés 2013). To the extent that this measure is implemented rigorously, it will hurt many cuentapropistas who sell imported products as their main business or on the side through products containing imported inputs as a supplementary activity to their main activity. It will also hurt the extensive network of citizens from all walks of life who had come to rely on the goods and services provided by these microenterprises. Indeed, writing at the proudly pro-revolutionary blog La Joven Cuba, Harold Cárdenas Lima openly called the measures “a step backward,” specifically criticizing the government for reverting to its typical “throw the baby out with the bathwater” approach to economic problems. A wide social network depends on these stores, from the salesperson to the truck driver, even the person who rents out their home. Behind each establishment there are six people whose livelihoods depend on it and now they are out in the street. But it’s not just the supply side that’s impacted. The citizens demand it as well. Their offerings are more varied and less expensive than in state stores. Whoever takes such measures should think about who is being impacted, and in this case it is a good portion of Cuban society (Cárdenas Lima 2013). Apart from the crackdown on clothing resellers, the newly clarified definitions of each self-employment occupation included specific restrictions on the exercise of a whole range of jobs. For example, radio and television antennas were restricted to receiving domestic signals only; metal polishers, jewelry repairers, and art restorers were restricted to performing services only and could not sell the products they service; and event planners could not operate night clubs. Likewise, those licensed to “operate recreational equipment” were now specifically prohibited from operating any aquatic equipment.8 Given this specification, it would seem that entrepreneurs who had been providing a wide array of recreational activities to the public (such as paintball, private cinemas, and video games) could now breathe a sigh of relief as long as they stayed away from said “aquatic equipment” (Gaceta Oficial 2013a, Resolution No. 42, Annex: 261). Furthermore, while Cuba’s Vice Minister of Culture, Fernando Rojas, seemed to want to reassure his readers by saying, “What, then, are we to do: prohibit or regulate? I think that it is about regulation, starting from a fundamental premise: Compliance by all with what is established by the cultural policy.” Both he and Roberto Smith, the president of Cuba’s State Film Institute (ICAIC), made clear the cultural authorities’ paternalistic if quixotic intention to continue to control the programming even of private entertainment venues given the supposed fact that private 3D theaters promoted “a lot of frivolity, mediocrity, pseudo-culture, and banality, which are counter to the policy that demands that cultural consumption for Cubans prioritize quality only” (Juventud Rebelde 2013; Cubadebate 2013; Álvarez 2013a; Uno de Guanajay 2013; Espacio Laical 2013). Clearing up any doubt as to the legality of such cinematic operations — and putting to rest any questions about the Revolution’s cultural policy or the relative “banality” or “quality” of the 3D films shown in private spaces — Cuba’s all-powerful Executive Committee of the Council of Ministers, headed by Raúl Castro himself, issued its now infamous Nota informativa sobre el trabajo por cuenta propia in Granma on November 2, 2013, which included the following phrases printed in bold: they “have never been authorized” and “they will cease immediately.” Such a message following Rojas’ expressed preference for regulation over prohibition sent a mixed, chilling message to Cuba’s cunetapropistas to say the least. Clearly then, the issue at hand was never the supposed banality of the programming in private theaters given that both state television and state-run theaters are filled with banal offerings — both those pirated from Hollywood as well as others produced in Cuba — to say nothing of the banal and pirated content of the CDs and DVDs legally hawked on Cuba’s streets by thousands of other licensed cuentapropistas (in open violation of international copyright laws) (Pérez 2013; Palacios 2013; Álvarez 2013b; Azor Hernández 2013; Kozlowska 2013; Espacio Laical 2013). Instead, the real issue is protecting the state film production and exhibition monopoly together with its paternalistic control over private spaces lest they be used for undue enrichment or to propagate ideas at odds with the Revolution (Dilla Alfonso 2013). The number of people employed in the microenterprise sector reached 391,500 by the end of 2011, up from 333,206 in September 2011 (Vidal Alejandro and Pérez Villanueva 2012). By March 2014 (the latest date for which official numbers were available), this number had grown to 455,577 (Cubadebate 2014; Mesa Redonda 2014; Cuba Central Blog 2014). This has indeed been an impressive quantitative increase relative to the 138,400 employed in the sector in 2007 and it represented a clear and significant increase over the 147,400 employed in the sector in 2010. 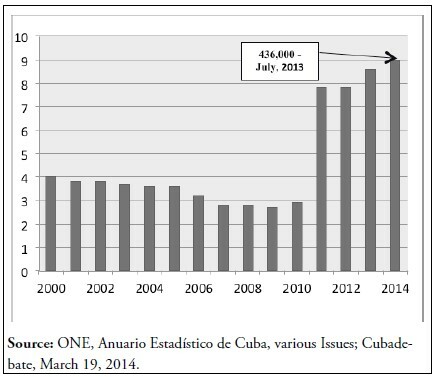 Put another way, Cuba’s once moribund entrepreneurial sector has grown more than 3-fold in a little over three years (late 2010 — early 2014) (Figure 1). This is to say nothing of the increase from 178 to 201 in the number of occupations in which it is now legal to become self-employed between fall 2010 and fall 2013. If a large amount of unregistered employment exists in the legal microenterprise sector, then in 2014 the government may well be approaching or even surpassing the 600,000 employment target for the end of 2012. However, it is impossible to tell if the government’s encouragement of non-state employment since late-2010 has created such jobs or only served to uncover previously existing clandestine activities. In terms of employment by economic activity in 2014, 57,776 or 12.7% of Cuba’s officially registered private workers were in food service (restaurants, cafeterias, and street vendors), another 47,733 or 10.5% were in transportation, and 29,952 or 6.6% operated “bed and breakfasts.” Another 91,978 or 20.2% were in fact employees working in the microenterprises of others rather than being the owners of microenterprises themselves (Cubadebate 2014). The major justification given for the promotion of microenterprise was to generate employment for workers who were considered redundant in the state sector. Judging from the limited statistical information available, this objective has not been fulfilled. Of the 333,206 employed in the microenterprise sector as of mid-2011, only 17% had come from the state sector. Some 16% were retirees. And another 67% had been outside the labor force, and presumably were either housewives, working in the underground economy, students entering the job market for the first time, or perhaps out of the labor force on disability pensions (Vidal Alejandro and Pérez Villanueva 2012: 47). Official statistics from March 2014 indicate that this trend has only continued, with 18% coming from the state sector, another 14% previously retired, and a whopping 68% declaring that they had been unemployed prior to registering as a cuentapropista (Cubadebate 2014). On the one hand, the microenterprise reforms have been a major success in that self-employment has grown to unprecedented levels, providing a wide variety of goods, services, and employment opportunities to Cuban citizens. On the other hand, part of this growth to date seems to have been driven more by the formalization of previously clandestine operators and less by incorporation of laid-off state workers, which was the government’s stated goal. Moreover, given the near prohibition on professional employment in the small enterprise sector, most of the growth in non-state employment has been in lower-technology though nonetheless important service occupations and not the higher-technology, value added professional activities that could contribute to more broadly to greater economic efficiency and productivity. The relatively small number of laid-off state sector workers in the microenterprise sector suggests that absorbing large numbers of redundant state sector workers into microenterprise activities will not be easy. For example, when workers in former state enterprises are informed that their place of business has been selected to be part of a transfer to the non-state sector — allowing the workers to become self-employed if they wish — the other alternative is for them to become unemployed (Freire Santana 2012; Frank and Valdés 2014). State sector downsizing also has been difficult to implement in practice. This is in part because few Cubans volunteered to serve on the committees that would identify their fellow workers as disponible for layoff (Alfonso 2012; Diversent 2010; Perera 2010). Alfonso, Pablo. 2012. “De cómo un idóneo se convierte en disponible,” Martinoticias, June 11. Alfonso Torna, Odelin. 2014. “¿Cuentapropistas: desempleados o ilegales?” Cubanet, January 30. Alonso González, David. 2013. “Para no fracasar por cuenta propia,” On Cuba, April 9. Álvarez, Julio Cesar. 2013a. “Censura en 3D,” Cubanet, October 29. Álvarez, Julio César. 2013b. “3D Movie and Video Game Rooms Going Underground,” Translating Cuba, November 5. Azor Hernández, Marlene. 2013. “La prohibición no es la salida,” Cubaencuentro, November 6. Cárdenas Lima, Harold. 2013. “Un paso atrás,” La Joven Cuba, October 24. Carrillo Ortega, Venus. 2012. “El 1 de diciembre comenzará en Cuba sistema de arrendamiento de locales estatales para servicios gastronómicos,” Cuba Información, November 9. Cartaya, Rolando. 2014. “Almost half of small businesses have gone under in Cuba,” Martinoticias, February 5. Castro, Raúl. 2013. “Discurso de Raúl Castro del 21 de diciembre, 2013,” Havana Times, December 22. Cave, Damien. 2014. “Cuban Vendors, in Rare Move, Stage a protest,” The New York Times, January 23, 2014. Celaya, Miriam. 2013a. “Cuentapropistas: Contra ellos viejo método de ‘premio y castigo’,” Cubanet, October 1. Celaya, Miriam. 2013b. “Trapi-shoppings: Cuentapropistas en riesgo,” Penúltimos Días, October 7. Cubadebate. 2013. “Los cines 3D deben cumplir la política cultural del país, afirma viceministro cubano,” October 27. Cubadebate. 2014. “Trabajo por cuenta propia crece y se valida como opción de empleo en Cuba,” March 19. Cuba Central Blog. 2014. “State media releases latest self-employment stats; Poor evaluations for almost half of Cuba’s state enterprises,” March 21. Cuba Dice. 2013. “Trabajo por cuenta propia,” October 9. Cuba Emprende Foundation. 2014. “What we do, about us, and who we support,” CubaEmprende- Foundation.org, March 4. Dámaso, Fernando. 2013c. “The Return of Illegality,” Translating Cuba, November 11. DDC (Diario de Cuba). 2014b. “Más de 407.000 cubanos han visto fracasar sus negocios por cuenta propia,” February 1. DDC (Diario de Cuba). 2014c. “Holguín: Testigos de la protesta, cuentapropistas narran lo ocurrido,” February 10. Dilla Alfonso, Haroldo. 2013. “Cuando el Granma regurgita,” Cuba Encuentro, November 18. Diversent, Laritza. 2010. “Entre no idóneos y disponibles,” Jurisconsultocuba, October 21. El Universal. 2014. “Descontento de trabajadores a cuenta propia provoca manifestación en Cuba,” January 24. Espacio Laical. 2013. “La polémica: En torno al cierre de los cines 3D,” Volume 4, pp. 128–142. Feinberg, Richard. 2013. “Soft landing in Cuba? Emerging Entrepreneurs and Middle Classes.” Latin America Initiative Working Paper, Brookings Institution, Washington D.C., November. Frank, Marc. 2013b. “Cuba to open state-run wholesaler for private companies,” Reuters, March 7. Frank, Marc. 2013c. “Cuba moves to safeguard monopoly on imported goods,” Reuters, September 26. Frank, Marc and Rosa Tania Valdés. 2014. “Cuba looks to cooperatives to slow rise of capitalism,” Reuters, April 13. Freire Santana, Orlando. 2012. “Comineza el arrendamiento de locales gastronómicos estatales a los trabajadores,” Cuba Verdad, November 29. Freire Santana, Orlando. 2014. “Cuentapropistas: No se pasen de la raya,” Cubanet, January 22. Gaceta Oficial de la República de Cuba. 2013a. Ministry of Justice, Special Edition, No. 27, Resolution No. 353/2013, Resolution No. 41/2013, and Resolution No. 42/2013, September 26. García, Anne-Marie. 2013. “Cuban Ban On Import Sales Leaves Entrepreneurs With Uncertain Future,” Associated Press, October 18. Granma. 2013. “Nota informative sobre el trabajo por cuenta propia,” November 2. Herrero, Ric. 2014. “Cuba hardliners suppress free exchange of ideas,” Miami Herald, May 19. Juventud Rebelde. 2013. “La vida en 3D?” October 27. Kozlowska, Hanna. 2013. “Can The Castro Regime Ban 3D Movies… And Survive?” Passport, Foreign Policy Magazine Blog, November 13. Laffita, Osmar. 2013. “Self-Employment or Private Property,” Translating Cuba, September 8, 2013; Originally published in Cubanet, Aug 30. Martinoticias. 2014. “Cuentapropistas bajo fuerte vigilancia,” January 22. Mesa Redonda. 2014. “Situación actual del Trabajo por Cuenta Propia,” Part 1, March 20 and Part 2, March 21. Monzó, Rebecca. 2013. “Small Businesses,” Translating Cuba, August 22. Morales, Emilio. 2013. “Cuba eleva precios para el mercado mayorista,” Café Fuerte, March 23. ONE (Oficina Nacional de Estadísticas), Anuario Estadístico de Cuba, various issues and years. Orsi, Peter. 2013. “Cubans heartened by possible reversal of 3D ban,” Associated Press, November 12. Palacios, Daniel. 2013. “Ola de críticas y descontento popular por cierre de cines 3D,” Café Fuerte, November 7. Palacios Almarales, Daniel. 2013. “Tensión entre vendedores de ropa importada ante inminente cierre de sus negocios,” Café Fuerte, October 31. Peláez, Orfilia et al. 2014. “Expectativas por cuenta propia,” Granma, January 31. Perera, Alina. 2010. “No es cuestión de edad: se queda quien mejor trabaje,” Juventud Rebelde, October 30. Pérez, Tómas E. 2013. “Muchísimas preguntas (y casi ninguna respuesta) sobre los cines 3D,” El Colimador, November 3. Peters, Philip. 2013a. “The Hard Part,” Cuban Research Center, August 19. Peters, Philip. 2013b. “A Chronology of Cuba’s Economic Reform,” Cuban Research Center, August 19. Peters, Philip. 2013c. “A step back, a step forward,” The Cuban Triangle, October 1. Rainsford, Sarah. 2013. “Tighter rules threaten Cuba’s independent clothes sellers,” BBC, October 12. Ritter, Archibald R.M. and Ted A. Henken. 2014. Entrepreneurial Cuba: The Changing Policy Landscape. Boulder: FirstForumPress. Rodríguez, Alejandro. 2013. “Negocios privados en Cuba: El malestar en la acualización,” On Cuba, October 1. Rodríguez Milán, Yisell. 2013. “3D Dilemmas,” On Cuba, August 9. Sánchez Serra, Óscar. 2013a. “Orden y legalidad: Un interés de todos,” Granma, November 11. Sánchez Serra, Óscar. 2013b. “La ruta de la indisciplina y las ilegalidades,” Granma, November 15. Tamayo, Juan O. 2013. “Periódico Granma reconoce malestar por el cierre de cines y tiendas privadas en Cuba,” El Nuevo Herald, November 12. Tamayo, Juan O. 2014. “Street protest in Cuba draws at least 500, sparks clash with police,” The Miami Herald, January 22. Tamayo Batista, Hilia. 2014. “Continúa organizándose el trabajo por cuenta propia en Cuba,” Radio Rebelde, February 18. Torres Hernández, Yirmara. 2014. “Mitos y realidades del TPCP en Cuba,” Radio Coco, January 23. Trabajadores. 2012a. “Comenzará en breve arrendamiento de locales gastronómicos estatales,” December 1. Trabajadores. 2012b. “State Gastronomy Premises Will Soon Be in Rent,” December 4. Ulloa García, Alejandro. 2013. “Espacios públicos, negocios privados,” On Cuba, April 23. Uno de Guanajay. 2013. “La política cultural del país,” October 30. Valdés, Rosa Tania. 2013. “Conflict brews in Cuba over ban on sales of imported good,” Reuters, October 3. Vega, Verónica. 2014. “La muerte en 3D,” Diario de Cuba, January 10. Vidal Alejandro, Pavel and Omar Everleny Pérez Villanueva. 2012. “Apertura al cuentapropismo y la microempresa, una pieza clave del ajuste estructural,” in Miradas a la economia cubana: El proceso de acualización. Edited by Pavel Vidal Alejandro and Omar Everleny Pérez Villanueva. Havana: Editorial Caminos. Xinhua News Agency. 2013. “Prensa official respalda cierre de salas privadas de cine 3D en Cuba,” November 11. 1. This paper is extracted from chapter 5 of the forthcoming book by the authors, Entrepreneurial Cuba: The Changing Policy Landscape (Boulder: FirstForumPress, Lynne Rienner Publishers, 2014). 2. Cuba’s now ubiquitous home-based restaurants were born in the early 1990s in much the same way. While paladares were not included on the original list of 117 occupations legalized in September 1993, inventive cuentapropistas took advantage of a vague “et cetera” included on the original list in order to set up Cuba’s first paladares before they were explicitly outlawed in December of that same year. New legislation that specifically legalized them was later passed in 1995. 3. Likewise, the small number of increasingly popular paintball arenas — some of which have partnered with moribund state-run parks and sports arenas — rely on informal import networks to obtain supplies that are simply unavailable on the island at any price (Ulloa García 2013). 4. This shift was confirmed by observations during a March 2014 visit. 5. Even the well-known pro-government blogger Yohandry Fontana reacted negatively to the ban Tweeting: “Bad news. Wouldn’t it be easier, I ask, to approve the sale of imported clothing by the self-employed than push this activity into the black market?” (Valdés 2013). 6. This was followed by a March, 2014, protest and near riot of an estimated 500 people in Holguín after an altercation between cuentapropistas and police as authorities fined and attempted to close down some of the banned businesses. The Miami Herald quoted Eduardo Cardet, a Holguín physician and member of the opposition Christian Liberation Movement, as saying: “It’s no longer the opposition protesting. Now, it’s the people” (Tamayo 2014; Martinoticias 2014; Freire Santana 2014; Cave 2014; El Universal 2014; DDC 2014c). 7. Some of this outpouring of debate over self-employment has taken place on video. For example, the independent organization “State of Sats” (Estado de Sats) recently recorded an hour-long discussion entitled, “Self-Employment in Cuba: Reality or Illusion?,” September 12, 2013. Likewise, a ten-minute segment of the October 9, 2013 episode of Cuban state television’s weekly show Cuba Dice (Cuba Says) focused on the popular debate over the new self-employment regulations. Other recently produced videos relating to self-employment include a two-part episode, Situación actual del Trabajo por Cuenta Propia as part of the official state television series Mesa Redonda (“Round Table”), March 19–20, 2014; a short video entitled “Cubans in the New Economy: Their Reflections and the U.S. Response” from a day-long conference hosted by The Center for Democracy in the Americas, November 13, 2103; a panel video from the conference “Cuba-U.S. Relations in the Second Obama Administration: The Cuban-American Community and Changes in Cuba,” sponsored by Cuban Americans for Engagement (CAFÉ) and featuring Abiel San Miguel Estévez, proprietor of Paladar Doña Eutimia in Old Havana, March 15, 2014; and a video explaining the work of the Cuba Emprende Foundation at its website, March, 2014. 8. The exact words are: Instala, opera o alquila equipos para la recreación de la población. No incluye los equipos náuticos. 9. On Cuba journalist Tómas E. Pérez even interviewed a 3D cinema operator who showed him a signed, stamped official permission form from the local municipal authorities authorizing him to erect a sign advertising his business. “If the sign says ‘Cine 3D El Marino,’ ” the man told Pérez bitterly, “what do you suppose my business is? A café?” Thus, despite the insinuations of both the Juventud Rebelde article and the later Granma clarification on November 2, such businesses were not something that operators sneakily “got away with” but instead activities that they “applied openly to do.” Another operator explained to Pérez that she was asked for and provided photos of her operation when she applied for her license, indicating the dimensions of the theater, the size of the television, and the style and number of seats to be used (Pérez 2013). 10. See Richard Feinberg’s fine recent report on self-employment, “Soft Landing In Cuba? Emerging Entrepreneurs and Middle Classes,” published by the Latin American Initiative of the Brookings Institution, November 2013, for a detailed estimate of the true size of Cuba’s current private, “non-state” sector. 11. The standard legalese in these cases is: los empleados de tales unidades que no deseen incorporse al modelo, cesarán su vínculo laboral y se les aplicará el tratamiento de trabajadores disponibles (the employees of said units who do not want to join the new management model will lose their status as employees and will be considered as available workers) (2012). Cuban sociologist Neili Fernández Peláez captured this sentiment well when she criticized the government’s new “embrace of self-employment” in an e-mail to us as more an abandonment of “the promise of full employment” than recognition of greater labor rights and economic freedoms.